Inlays and onlays are often referred to as partial crowns. They use existing teeth as a base and the inlay or onlay thus fits onto the tooth. This is done to strengthen the tooth, restore its shape, and prevent further damage. An inlay is used when there is no damage to the cusps of the tooth and is consequently placed right on the tooth. An onlay is used when the damage is a little more extensive. 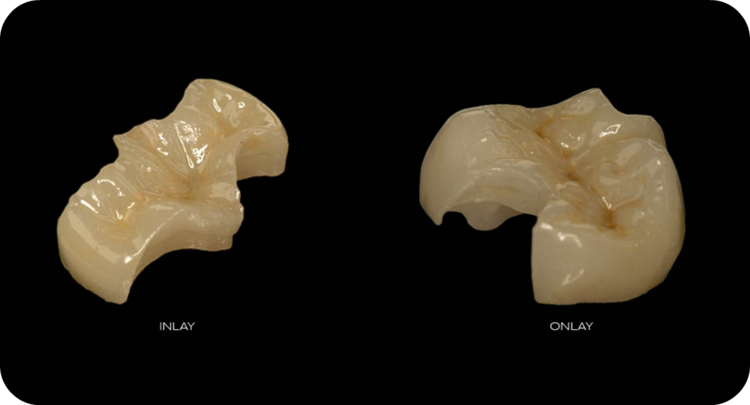 What is the process of ceramic inlays and onlays? The decayed area of the tooth is first removed, then a mold of the tooth is taken and sent to our dental lab. A restoration will be made there from porcelain, gold, or a composite resin, which takes about 2-3 weeks to make, so a temporary inlay or onlay will be placed on the tooth for that time. During the next visit, the inlay or onlay will be placed into the mouth and set with cement, leaving both your tooth looking natural and the inlay or onlay practically invisible.